Powers/Abilities: The spinybeast's touch meant death for whoever touched it. It is unknown if it was for the spines which covered its body, or for some venomous or sorcerous ability. The spinybeast walked on four legs and each leg had three claws or spines. Its size was similar to a dog, but with spines instead of hair. Its tail was not so long and consisted of a single spine. It could be controlled by Nightmare's mystic prod. 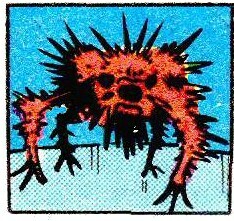 History: (Strange Tales I#116/2) - The spinybeast lived in the Dream Dimension; its home there was a prairie with low vegetation composed mainly of spines. The spinybeast was used by Nightmare who wanted the creature to kill Doctor Strange. Nightmare menaced the spinybeast using a mystic prod, forcing it to approach Doctor Strange in an effort to have him touch it. Strange, suddenly using the glow from his amulet, temporarily blinded Nightmare. Unfortunately for the beast, Nightmare lowered the prod-wand, which touched the spinybeast, instantly killing it. Comments: Created by Stan Lee (writer) and Steve Ditko (pencils & inks). or any other "spiny" or "beast" characters. or any other "Dr." or "Warren" characters. The mystic prod, also called prod-wand or rod-wand, was a weapon used by Nightmare to menace the spinybeast. Its top emitted a constant spark and its touch was deadly for a little creature like the spinybeast. Dr. Warren was among the persons who tried to solve the mystery of the persons who had fallen asleep and never awoke. He knew Doctor Strange's reputation and, along with a policeman, asked the sorceror to help. Eventually, Doctor Strange succeeded in freeing the "sleepers" from Nightmare's realm.